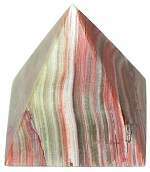 Onyx is banded agate displaying straight and parallel bands of alternating colors. It belongs to the Chalcedony family of quartz and comes in a surprising array of natural colors from pale to deep greens and reddish browns. 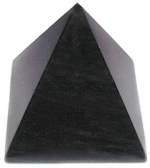 Beautifully polished 2" gemstone pyramid from Pakistan. 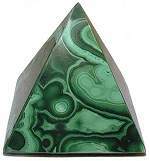 Extremely rare Malachite 50mm Pyramids with bull's-eye markings, from Zaire, have unique ornamental banding in contrasting green hues. In ancient cultures Malachite was used as a power stone providing intuitive insight and guidance on the spiritual journey. 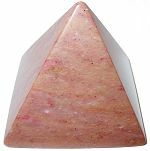 Beautifully polished 2" gemstone pyramid with minor natural pitting due to the nature of the stone. Beautiful Black Obsidian from the volcanic bowels of Mother Earth. This is a very popular stone and used from ancient times in Shamanic healing rites. High polish and shine 2" gemstone pyramids originate from Mexico. 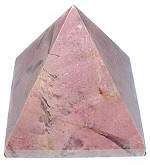 Unusual Pink Rhodonite Pyramids with no black manganese oxide crystals. Rhodonite varies from a pink to lavender gemstone and is said by Crystal Masters to balance the yin-yang energies and assist in the attainment of one's greatest potential. 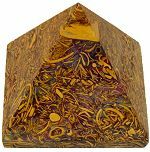 Superb hand carved and polished Calligraphy Stone Pyramids from India, named in the West for the eye catching, intricate red swirls that resemble artistic calligraphy. Originally called Sang E Mariam Holy Stone in the Middle East. This stone is found in the Holy Land as well as India and Persia. It's name means Mary's Stone and the legend is that Mary gave birth while laying on this rock. It is comprised of ancient fossil shells that formed in an agate matrix and is revered as a mystical stone in the East. Beautifully polished 2 1/4" gemstone pyramids. 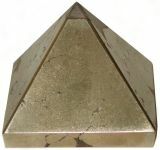 Iron Pyrite gemstone pyramids have a gold mirror like finish. Pyrite well known as fool's gold, is said to be a very potent protector, shielding one from intense negative energies. 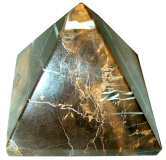 Hand carved and polished natural Iron Pyrite Pyramids. Obsidian takes on Snowflakes when a white mineral Phenocryst is present. It is a stone of purity, bringing balance to body, mind and soul. 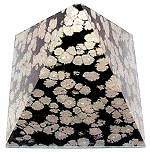 Beautifully polished 2" Snowflake Obsidian Pyramid. Rhodonite is said to balance the yin-yang energies and assist in the attainment of one's greatest potential. These high polish Peru Rhodonite pyramids have the well known pink matrix with the dendritic, black tree like formations of manganese oxide crystals. 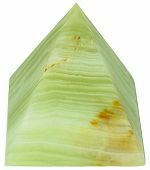 These Black and Gold Pakistani Onyx pyramids have drama and eye appeal, they will add sophistication and interest to any home or office decor. Onyx or Agate is well known for its beautiful banded colors and markings. It belongs to the Chalcedony family of quartz and is said to dispel negativity and have a cleansing effect.